A2 Key for Schools is a qualification that shows a pupil can deal with everyday written and spoken English at an intermediate level. A2 Key for Schools is specially tailored to suit the interests of pupils, so it increases their motivation to learn English. Because it is based on familiar topics and situations, it gives them the confidence to use their English and inspires them to move on to further qualifications. Cambridge English: Key for Schools follows exactly the same format as A2 Key and the level of the question papers is identical. The only difference is that the content and treatment of topics in A2 Key for Schools have been particularly targeted at the interests and experience of school pupils. Choose when and how you take your exam - A2 Key for Schools is available as either a paper-based or computer-based exam, allowing you even more choice over how you take your test. More than 3,000 employers, universities and colleges, government departments and other organisations around the world rely on Cambridge English. What does A2 Key for Schools involve? A2 Key for Schools is an elementary level assessment of English. It consists of three papers: Reading & Writing, Listening and Speaking. The Speaking test uses a face-to-face test with two candidates and two assessors. This creates a more realistic and reliable measure of your ability to use English to communicate. The A2 Key for Schools Reading & Writing paper has nine parts and different types of texts and questions. Parts 1–5 are about reading and Parts 6–9 are mainly about writing. Candidates are required to show that they can understand simple written information such as signs, brochures, newspapers and magazines. This paper accounts for 50% of the total mark. The A2 Key for Schools Listening paper has five parts. For each part candidates have to listen to a recorded text or texts and answer some questions. Each part of the recording is heard twice. Candidates are required to be able to understand announcements and other spoken material when people speak reasonably slowly. There are some regional British accents and occasionally Irish, American or Australian speakers and recordings are delivered clearly at slightly slower than natural speed. This paper accounts for 25% of the total mark. The A2 Key for Schools Speaking has two parts and will be conducted face-to-face with one or two other candidates. This makes your test more realistic and more reliable. There are two examiners. One examiner talks to you and the other examiner just listens. Both examiners decide your grade. The Speaking test accounts for 25% of the total mark. Try a paper-based sample A2 Key for Schools exam paper. Score This is based on your total score in all five papers and is shown as a number between 0 and 100. Grade The grade you are awarded depends on the score you achieve. Candidate profile This shows your performance in each paper (shown against the scale Exceptional - Good - Borderline - Weak). Depending on which university, college or organisation you are applying to, you may be asked to achieve a specific score or grade. Organisations may also ask you for a particular candidate profile if they need you to have a specific level of English in one of the five skills. You can access your results through the Cambridge English Results Online website. Exceptional candidates sometimes show ability beyond A2 level. 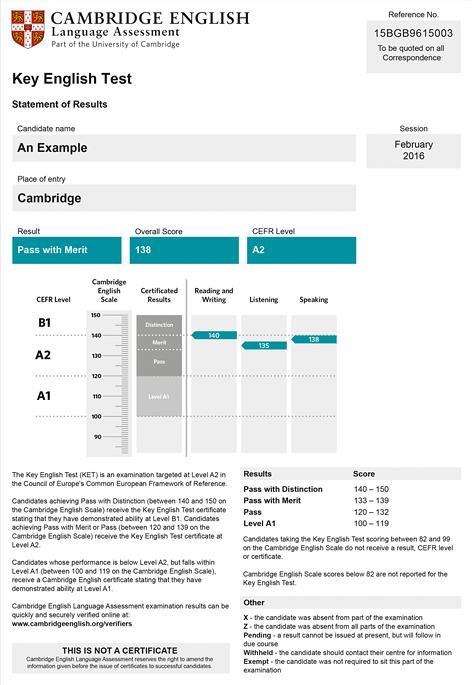 If you achieve a Pass with Distinction in your exam, you will receive the Cambridge English: Key certificate stating that you demonstrated ability at Level B1. If you achieve a Pass with Merit or Pass in your exam, you will be awarded the Cambridge English: Key certificate at Level A2.